Although I LOVE everything about fall- love decorating our house with fall decor, fall scents, fall foods, fall colors, fall holidays, I'm not looking forward to what is coming up. What to do? I am so not looking forward to the upcoming weeks here at the Huskey household. My parents are going out of town for a mission trip in Montana for 2 WEEKS---might I remind you that I speak to my mother at least 4-5 times a day. This is going to be bad. In that same time period, Stephen will be out of town with work, AHHH!! Thank goodness for Grady or I’d be all alone. Is looking forward for the end of September too much to ask? Here I am wishing my life away. This may be a great time for me to put up my fall decor and put up my summer decor. Maybe I should do a little shopping in between? Oh yeah. 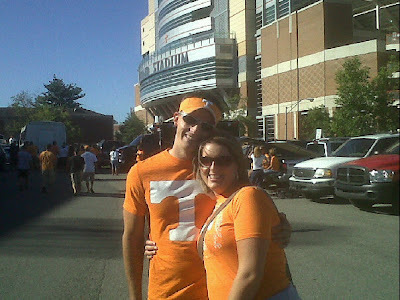 Stephen and I are huge football fans (Stephen more than me because I only enjoy watching the UT VOLS). We were fortunate enough to be able to go to their 1st game this season with our good friends Summer and Paul whom we LOVE! We had a BLAST and the seats were FABULOUS. We even got to see Peyton Manning! Yahoo! The weather was fantastic and the stadium was packed with supportive fans (as always)! I’m looking forward to more fall weather and more Saturdays celebrating our victories! The Vols did beat UT Martin 50-O! Hooray- GO BIG ORANGE!